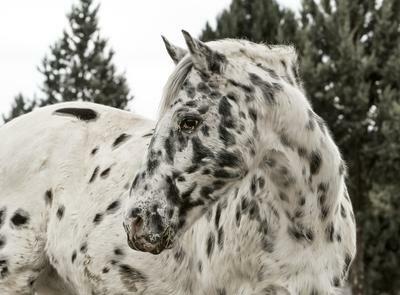 Hello, I’m Blue, a wild, spotted Appaloosa mustang, and I live in the wild, wherever our lead mare takes us. A place of freedom. I wasn’t always wild, you know. So here is the story of my capture, escape, and once again free to live with my family, my herd. I heard it like it happened yesterday, I still do sometimes. The smell of men in the wind. The horrible sounds of the human predators as they whirled their ropes over their heads. There was nowhere to flee! My little foal Nasha crying loudly from a distance, calling me back, Allis, the lead mare, was keeping her from me. Myself, being dragged away to who knows where, my own cries echoing through the hills as if from someone else. I jerked from the men, trying to escape, then one of the men spoke, "Mother, mother! Are you awake!?" I shook myself awake, "Oh, it’s you Specks you sure gave me a scare!" Specks is my second foal, from after the capture, but now she has a foal of her own. "Mamma, were you dreaming? You whinnied so loud!" I shook my mane, "No, no you go back to sleep, I’m fine." She gave me a funny look then fell back asleep. Then I started thinking. I had lied, I did dream, about a long time ago, when I lived with a herd, out in the wilderness. I had a foal, named Nasha, and then the men came and took me far away. But that was 3 years ago. Nasha must be about 4 years old now, I thought. Now, I was stuck in this tiny pen, on a dude ranch, broken cruelly, and either forced to walk slowly in a line of bad tempered horses, with a man on my back, or pulling a useless plow back and forth. I didn’t want that for Curly, Specks first foal. I wanted all of us to be free. I knew my herd was out there, it had to be. I often stood facing west, calling home. The next day was the same as the day before, and the day before that and the week before that. In the morning, we got this weird sweet food that men call grain, for breakfast. Then work at whatever they made me and Specks do. Then we were taken back to the pen for more grain in the evening. End of day. "Mamma! Are you listening to me?" "Yes, I’m sorry, what were you saying?" I said turning from the fence and nuzzled her apologetically. "t’s ok mamma, listen I’ve been thinking, you have been acting super weird and I think I know why. So I have come up with an idea. I want to escape with you, I want to leave and Curly needs to live in freedom." "But isn’t Curly to young? It’s a long journey from what I remember." I said, looking at the petite Curly, who was chasing a butterfly. "Mom, she’ll be fine! I really think we need to get out of this tiny fence." She snorted, staring at my now skinny self to prove her point. I looked down, and then looked over at Curly then back at Specks a bit worriedly. Curly nickered at me, bobbing her head, with her ears forward. "Let me think about it, tomorrow I’ll tell you." Specks did a little buck and trotted over to the corner with Curly. It took everything to keep me from snorting indignantly at her smugness. Then I drifted off to sleep. "Please, Please, PLEASE!?" This time I did snort. It was so early in the morning! "Oh all right, all RIGHT!" You two are ganging up on me so I might as well. "WHOOPEE!!" They squealed, galloping round and round the pen until I had to join. Then a man yelled at us to stop. Out of nowhere, Indians came galloping from the woods, whooping and shouting on their painted war ponies. There was gunfire, the most terrifying sound, like thunder, and a fire was started. Men and horses were running everywhere, and we were forgotten in the chaos. I could smell fear in the air, and the very strong scent of smoke. Then a horse was slammed into the fence, splintering it to pieces. Specks and Curly’s instincts weren’t that sharp from an easy life. Sometimes it was hard to find water and Curly often complained. When other times, we had plenty of water and Curly frolicked ahead. A week later we came upon a forest. Forests are great for water and good places to hide, but there are also cougars, and good places for THEM to hide. "Specks, I want you to keep a sharp eye on Curly, forests are dangerous places for horses who don’t know them." "Okay and mamma? I really want to meet Nasha." "Yeah, I want you to too." Later we reached a river which wasn’t unusual, so we crossed it. But halfway across, Specks screamed. Curly had lost her footing and was being washed downstream, toward me. "Help me!" Curly cried. I lunged forward bracing myself, then crash! Curly had been swept into me. I had caught her! I helped her the rest of the way across. "Thank you, that was scary, I love you so much!" Curly said now curled up between Specks and I later that night. "Curly," I replied turning to her, "horses in a herd look after each other. They work together, and protect each other. Remember that." She looked at me with those sweet eyes, "I will." Trotting over hills, through valleys, and near the end of the woods, we had a bad scare. We were trotting along, when out of the blue, I smelled cougar above me. "Specks! Curly! Get away from the tree, run!!" Curly reacted first, bolting away. But too late, a cougar leaped out of the tree, and onto Speck's back! She screamed. The cougar had clawed gashes into her beautiful coat. Bucking, and squealing, I realized I had to help her. I reared, biting the howling cougar. He finally realized he was no match for us, and slunk away. Specks stood shaking, while Curly and I stood beside her. We left the woods to the plains, and encountered other hardships, such as stony ground and other things I don’t want to say. Finally, I smelled horses in the wind! I led them through the hills, confused because I couldn’t see any horses. When I looked behind me, Curly wasn’t there! "In here! Come and see!" The voice came small, seeming to come from in the hill behind us. I trotted over, to find Curly standing at the mouth of a cave. Of course! The mustangs’ secret hideout! We trotted through the cave, and the other side seemed like paradise. There was a waterfall, pouring into a pool, and the best grass I’d ever seen. Since we were all tired, we fell asleep. Suddenly, I leaped up and stared into the face of our herd stallion, Lightning. Specks and Curly scrambled up behind me. I looked around, and saw Allis, the lead mare, with a foal about Curly’s age. And behind them, stood most gracefully, was Nasha! "Blue, is that you?" He said, sniffing me all over, cringing at the faint smell of men. "Yes, it’s me, I’m back, and this is Specks, my foal, and her foal, Curly." He turned to the herd and then they all came up to us. The two foals started playing with each other, and Allis, Specks and I talked about the herd. Then I moved over to Nasha, who stood frozen in place. "Nasha, do you remember me?" I asked nuzzling her. "Oh mamma! I do! Allis has been so kind to me, but I remember you!" "Oh Nasha! Just look at you!" I stepped back to admire her, and she lowered her head shyly. "Oh Nasha, we can be together again! I’m so happy!" When I introduced Nasha to Specks, my heart was so full I thought it would burst. I was so happy to be free again. So now I live free with my herd, and always will be. Thanks! I have a whole bunch more to post, my writer name will be horses4friends! From a fellow writer: Great! I Loved It! I am very impressed! Great job writing! Keep writing stories, and you can bet that I'll be reading them! Thank you all! I had a lot of fun writing the story and I'm writing more! I really like your story! It really shows the life of a wild horse! You have talent, and I love your story! It's from the horse's point of view, that's cool! Write more stories for us!